Executives and CTOs today are faced with a myriad of both technical and business decisions. When it comes to gaining insight and benefits from your software, customers and users, it's more important than ever to obtain real-time data to better inform those decisions. - What steps do execs need to take to improve the customer experience? - How can Mesosphere DC/OS simplify the development and operations of fast data applications to create a superior customer experience? 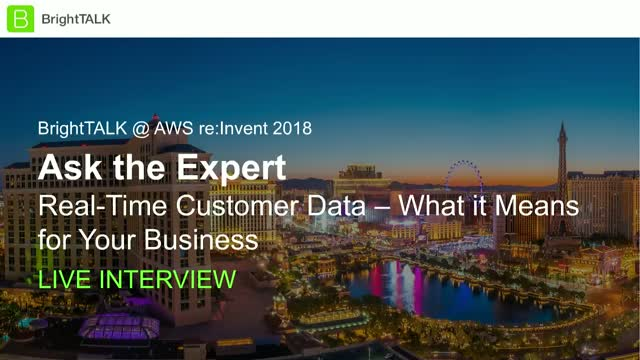 This one-on-one interview will be live-streamed directly from AWS re:Invent in Las Vegas! Tune in from the comfort of your desk to have all your questions answered. Aaron Baer, Lead Member of Technical Staff, athenahealth, Inc.
Healthcare systems traditionally lag behind from the curve of technology trends. Information is plentiful in the space of healthcare and data is typically in large silos. In this presentation we'll explore how our DevOps team is adopting microservices, breaking apart it's monolith, and adopting a new data fabric to allow for massive scale and increased innovation in the space of healthcare information as part of it's platform infrastructure platform. We'll talk about the architecture and tools chosen as well as what went well and what didn't along with some of the efforts still on going as part of this change. Economic growth is currently dominated by companies that are transforming how we live our lives with highly personalized, data-informed, real-time interactions. Many of the patterns and tools developed by Google, Twitter, Netflix and others to meet these new consumer expectations have been democratized through open source and cloud technologies. In this webinar, we will learn the what and when of cloud native architecture from the author of O’Reilly’s Cloud Native Infrastructure. The co-host will review each of the chapters sponsored by Mesosphere and ask the author about his own experiences as an early adopter of cloud native technologies. Learn from the lessons the author has learned from his own work in managing a Kubernetes cluster. 2. Navigate the challenges around managing different open source services, configurations, and versions needed for cloud native applications. 3. Leverage technology like Kubernetes, now available on DC/OS, to provide part of the infrastructure framework that helps manage cloud native application patterns. Most technology systems today are distributed systems, made up of app servers, databases, and caches. Managing distributed systems is tricky, and writing distributed systems is even trickier. Our mission is to make building and running these systems as easy as building or running an app on your smartphone. Mesosphere (Twitter: @Mesosphere) is dedicated to helping enterprises unlock the next generation of datacenter scale, efficiency and automation with Apache Mesos. DC/OS is an operating system that spans the entire datacenter and pools datacenter resources and automates IT operations. Backed by Andreessen Horowitz, Data Collective, Fuel Capital and Kleiner Perkins Caufield & Byers, Mesosphere is headquartered in San Francisco with a second office in Hamburg, Germany.